 During our extensive travels over the past twenty years we have visited every continent on earth - except Antarctica. So when we received an unexpected offer to travel to the White Continent we grabbed it with both hands. 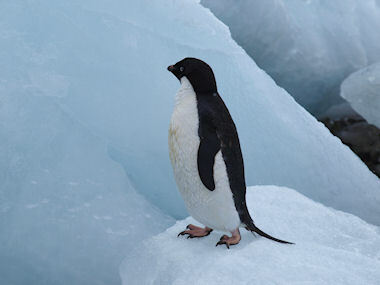 It is a very long way from Britain, and involves a lengthy and difficult journey via South America, Patagonia, and a potentially wild voyage across the Drake Passage south of Cape Horn. But despite some incredible delays, high winds and rough seas we made it - to enjoy a wonderful experience in unforgettable surroundings. 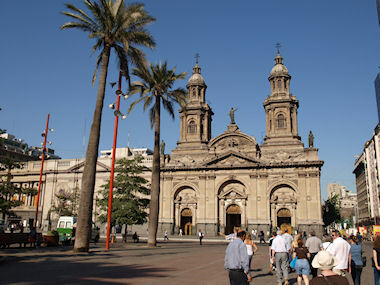 Our first port of call was Buenos Aires, Argentina's capital city. Although we only spent a short time here we found it to be a vibrant and colourful place, full of elegant architecture, open squares and wide avenues. 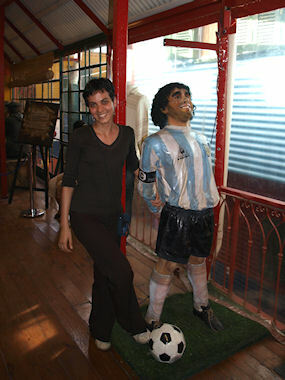 The Spanish heritage is evident everywhere, but also the influence of many other European cultures especially the French. 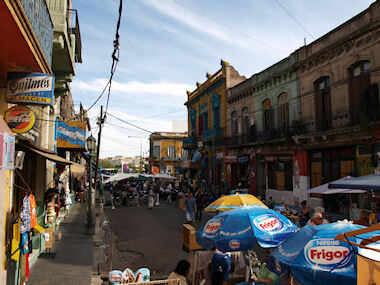 It is little wonder that the city is known as the Paris of South America. 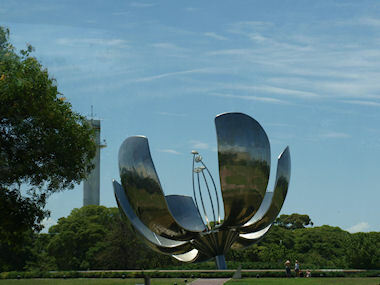 Our tour took us by a huge mechanical flower that opens and closes with the sun, and stopped at La Recoleta Cemetery where many influential Argentinians are entombed, the most famous of which is Eva Perón. 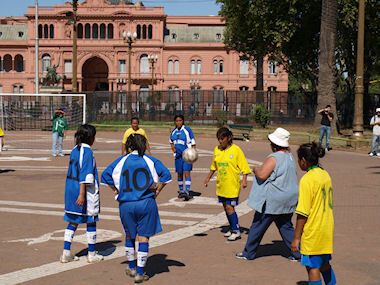 In the city's main square, the Plaza de Mayo, we saw two abiding images of Argentina - a political demonstration and children playing football. There is a bustle about the place, teeming with people apparently all with a purpose. While out shopping for cosmetics confiscated at Madrid airport we watched a street demonstration of the city's signature dance - the tango, and applauded those brave enough to join in. But like every major city Buenos Aires has another side, the Favellas, where the poorest live in squats and scratch a living from scavenging and recycling waste. We were taken to a district selling tourist trinkets, but warned to be gone by six in the evening when it is unwise to be a tourist abroad. Our young guide was philosophical about the future of her city in the looming recession, but she urged us all to 'always look on the bright side of life', a fitting epithet for all its citizens. 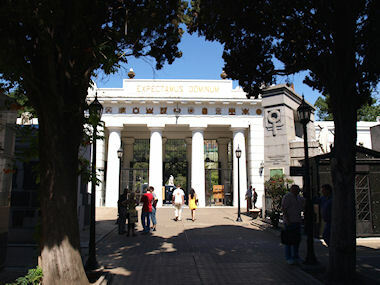 There are also gastronomic delights to be had at surprisingly low prices for a capital city. The beef is by far the best we have ever tasted, and is an art form in Argentina; we now have a benchmark against which all our future steaks will be judged. Combine this with a local wine made from the Malbec grape and you have a meal to savour for ever. Sadly we spent less time in the city than we had planned, thanks to Iberia, but we enjoyed our visit well enough to recommend it as a place to see. Patagonia is the region at the southernmost part of South America, partly in Argentina to the east and partly in Chile to the west. Our flight from Buenos Aires to the frontier town of Ushuaia on the Beagle Channel took just over two hours, crossing some of the wildest and remote mountains we have seen. Our arrival required clearing the Martial mountain range and then side-slipping to lose height for a short field landing at the tiny airport, no mean feat in a fully laden 747. 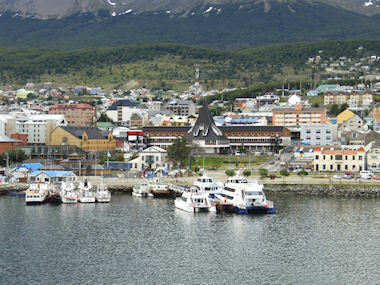 Ushuaia is the capital of the Argentine province of Tierra del Fuego and the southernmost city in the world, with a population of around 64,000. 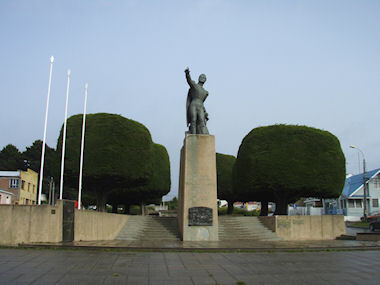 For most of the first half of the 20th century the city was centered around a prison for serious criminals, but today it is a thriving port and a prime departure point for travel to Antarctica. We saw little of the town on our way from the airport to the ship, but enough to understand what a hard life the locals must endure. It is windy and the weather changes by the minute, but the views of the surrounding mountains are spectacular. 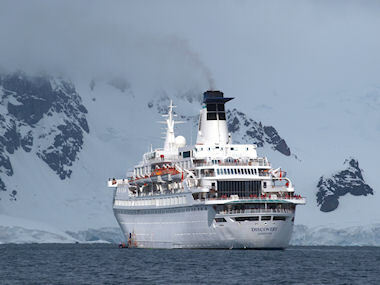 Our cruise to Antarctica was aboard mv Discovery, 20,000 tons of luxury with just 375 passengers and almost as many crew. 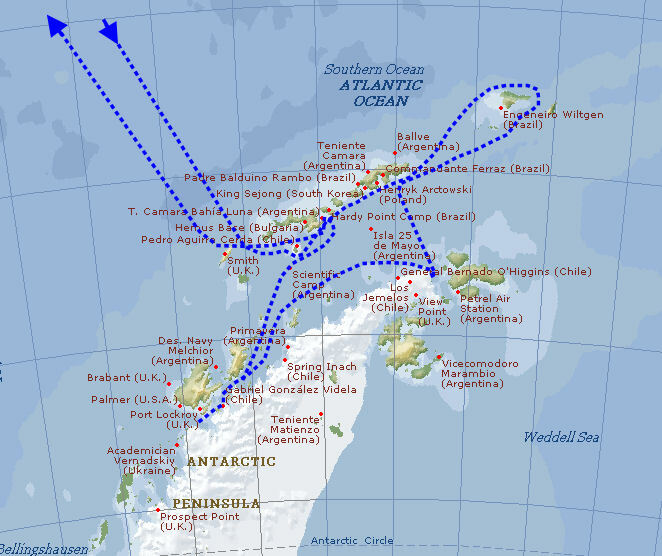 After navigating east along the Beagle channel we began our 36 hour 600 mile journey across the notorious Drake Passage to the South Shetland Islands. Our first sight of the White Continent was towering snowcapped mountains under a brooding angry sky from a lively rolling ship. 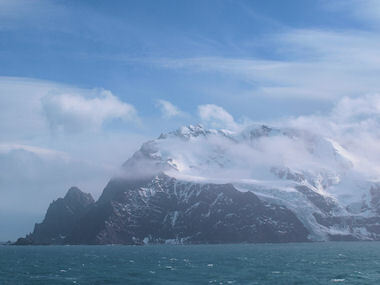 Unable to land at Deception Island we cruised north east to Point Wild on Elephant Island to see the spit of land where Shackleton's men were marooned for a whole year; how they survived the harsh conditions in such a remote place is beyond comprehension. 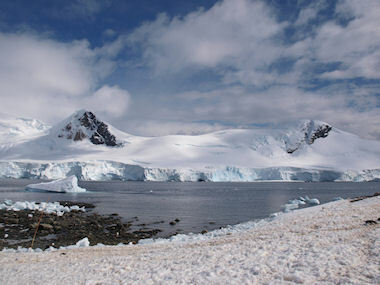 Humpback whales and chinstrap penguins were in abundance. 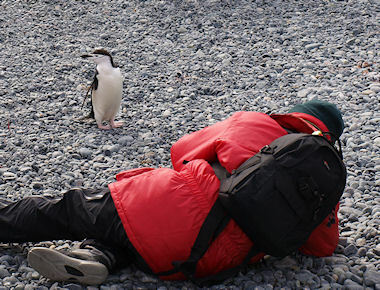 On our third day we arrived in Hope Bay at the north eastern tip of the Antarctic Peninsular to be greeted by thousands upon thousands of Adélie penguins, in bright sunshine and no wind, for our first landing. 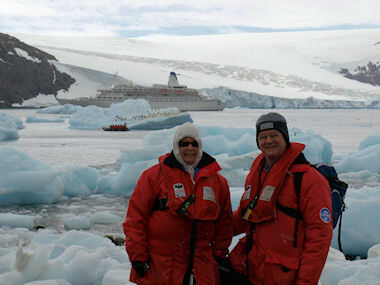 With a sense of anticipation sharpened by our long wait, we donned our Antarctic gear and life jackets and boarded the Zodiac boats for the transfer ashore. The spectacle was breathtaking - a teeming mass of wildlife against a backdrop of icy mountains and icebergs, with the high drama of watching the leopard seals waiting to catch their penguin breakfast. 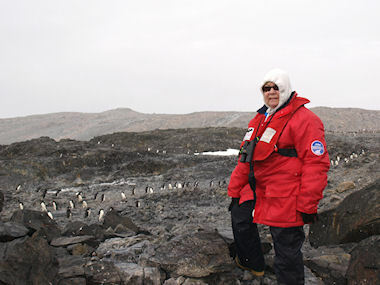 Overnight we cruised south west along the north west coast of the Antarctic Peninsular, arriving bright and early at Paradise Harbour where the Chilean Air Force have a small research station. This time, as seasoned explorers, we remembered to put on our cold weather gear in the right order and boarded the Zodiacs for Waterboat Point. Paradise Harbour is just that: a natural harbour ringed by rugged snow-capped peaks fringed with pristine blue ice, splattered on the water line with pink penguin poo. 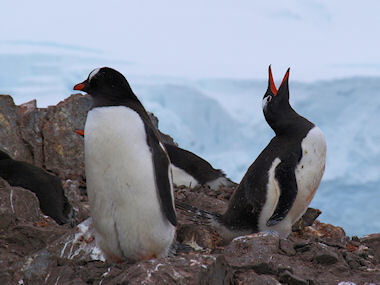 Gentoo penguin nests were everywhere, and their occupants fought each other continuously to defend their nesting pile of stones without getting off their eggs. This base was the only sign of human habitation we observed on the continent throughout the trip - for which we were truly grateful. 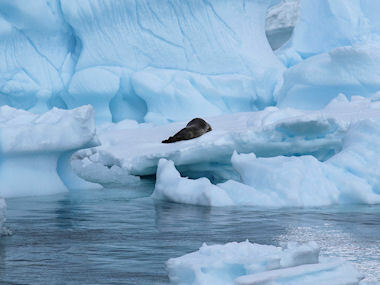 Our final landing was at Half Moon Island to see the Chinstrap penguin colony and its attendant giant petrels, skuas, terns, shags, kelp gulls and leopard seals. This time the beach was rocky and steep, but afforded us a superb all-round view of another natural harbour. Elsa watched a skua steal a penguin chick and swallow it whole, which seemed impossible as the bird was hardly bigger than its prey. 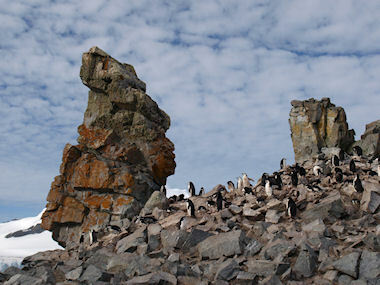 We saw many penguin eggs and newly hatched chicks, and marvelled at how so many could coexist in such a limited space. On the journey back to South America the Drake Passage showed its true colours with high winds and ten metre waves, but we both survived without a moment's sea sickness. Our captain, who lives just seven miles from us in Leamington Spa, congratulated us for only requiring forty sickness jabs among 375 passengers, pretty good given the conditions. He told us that we had seen the best and the worst of the weather, from bright sunshine and no wind to gales and rough seas, which was above par for these stormy latitudes. 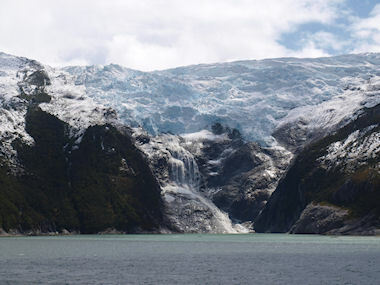 We sailed back through the ice strewn Beagle Channel and north into the Magellan Strait to dock in the Chilean port of Punta Arenas. After a turbulent take-off from a chilly (Chile!) 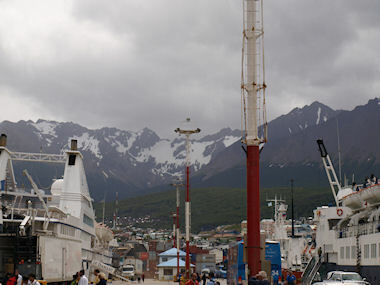 Punta Arenas we arrived in the capital Santiago with the mercury standing at 33°C. So it was off with the red parka et al and on with the summer gear, to enjoy a tour of this affluent city. 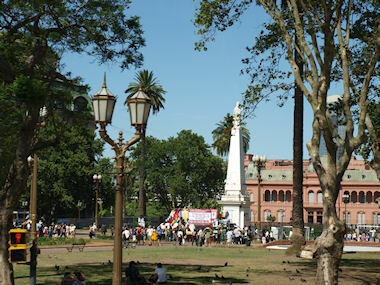 Unlike Buenos Aires, we saw no beggars; the cars were mainly large and new, the housing solidly middle class and the shopping and restaurants decidedly affluent. 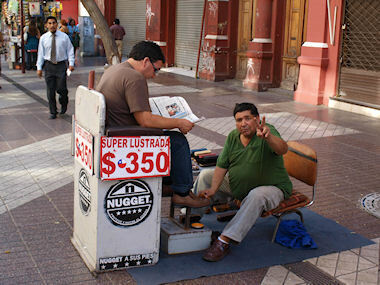 Prices were less than at home outside the hotels, and the locals were friendly and helpful. 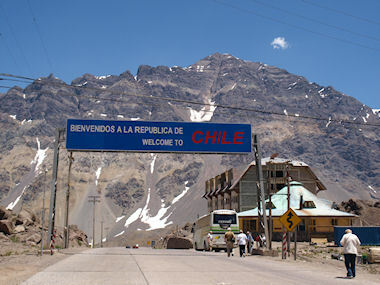 We learned that the British Admiral Lord Cochrane had much to do with gaining Chile its independence from Spain in the early nineteenth century, which explains the close ties between our two countries. On our second day we took a trip into the high Andes, and enjoyed lunch at a remote ski lodge at 9,600 feet close to the Argentinian border. It only rains for three months of the year in mid Chile, so they have a sophisticated irrigation system which stores the snow melt from the Andes in high reservoirs, using the water to generate electricity on the way down to irrigating crops and providing domestic water supplies. All this sunshine and abundance of fresh water produces the most amazing fruit and vegetables, much of it for export. Elsa raved about the delicious cherries on offer at breakfast and the quality of the vegetables served with all our meals; back home Chilean cherries were purchased on her next visit to Sainsburys! We loved the city and its people, ever willing to provide directions and help find restaurants and shops. There is a genuine service culture which makes such a difference to visitors, and English is widely spoken by most stratas of society. The city is clean and largely safe for tourists, and the girls are beautiful. On New Year's Eve we found a delightful restaurant to celebrate with our holiday friends, and enjoyed a splendid dinner in pleasant surroundings. 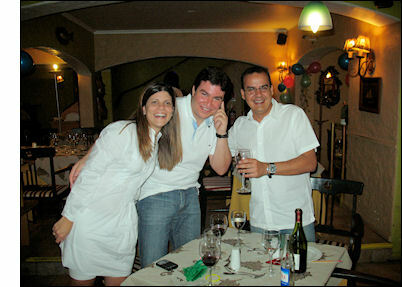 At midnight we let off steam and kissed everyone in true South American style. It was a fitting end to a wonderful holiday. Our holiday was organised by Voyages of Discovery.